I was the lucky recipient of a gift card in order to try the new hot chocolates that were released by Costa Coffee. I took a walk in the bright London sunshine on a particularly warm day to pop in and try some. Hot chocolate is usually a powder mixed into water or milk. 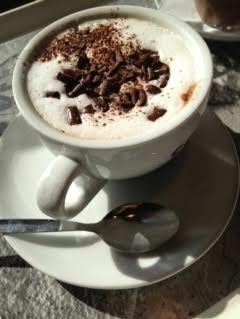 Lately however, Kokoa Collection and others have championed real chocolate in your hot chocolate. This gives a richer taste and makes things yummier for us. Thing is, it takes a lot of work to melt the chocolate in milk so you don’t often find it in a large chain coffee shop. One chain is trying to change this with two offerings – an intense shot and a more milky drink. The two hot chocolates are only available in one size – so no giant shots and no giant milky hot chocolates. 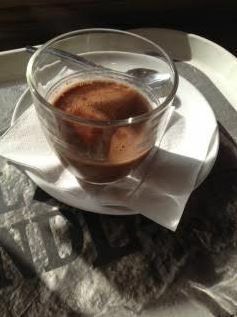 Hot Chocolate Shot – small & intense chocolate flavour. More nutty than fruity. Slightly bitter but balanced off against perfect level of light sweetness – not as thick as I expected but marks for intensity. This is going to be too much for some people with the intense chocolaty-ness but for those who want something more or those who add lots of chocolate powder to their hot chocolate, this is perfect. 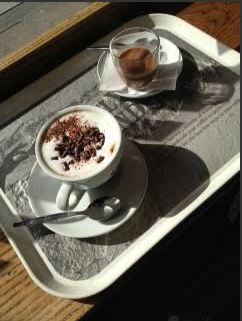 Belgian Hot Chocolate – is softer than the shot. Still distinctly nutty and quite chocolaty, where the shot is a slap round the face with a wet fish, this is a cuddle. The milk was too hot when it was served but the chocolate curls were a nice touch. So just be a bit careful when you take that first sip! Overall, I enjoyed them compared to what I’ve had from other large chains who really don’t have hot chocolate shots.